Hybrid of acidless pummelo and white grapefruit. Large tree. Medium-large grapefruit. 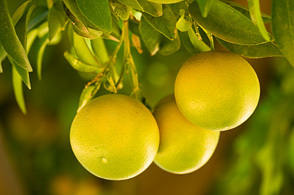 Pale yellow, mild sweet flesh, greenish-yellow rind. Fruit matures in early winter, holds well on tree.